El rooftop esta totalmente cubierto y hay parking gratuito en el hotel durante todo el evento. IMPORTANTE – Para estar en LISTA y poder entrar gratuitamente: hay que dar a ASISTIRÉ al evento y haber dado like a la pagina de Deeplomatic Recordings. Si vienes con acompañantes escríbelo en el muro! La lista se cierra el Sabado 28 de Enero a las 18:00, entrada gratis o 2 copas x 16€ hasta medianoche, después de las 00:00 se cobrará una consumición con la entrada. Saturday 28th of January! 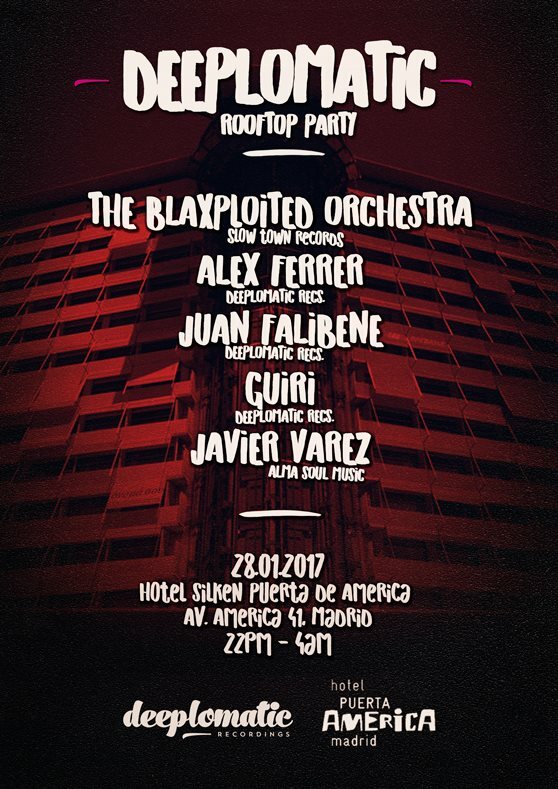 Deeplomatic is back with an awesome Rooftop Party at Hotel Silken Puerta América Madrid, the tallest rooftop in Madrid, with some incredible views from the capital! Come and enjoy one of the best sunsets in Madrid, with a great crowd and even better music! IMPORTANT – To be on the guest LIST and get in for free: click attend to the event and like the Deeplomatic Recordings page. If you come with guests add them on the wall too! The list closes on Saturday the 28th at 18:00. Free entrance or 2 drinks for 16€ until midnight, after 00:00 one drink must be purchased at the door to enter.